The 2018 conference marked an anniversary one for the hosting country who organized their third ICA event, keeping a steady 20 years between conferences (1978, 1998 and 2018); while another anniversary was scored for our Organization- the celebration of 50 years since the first inaugural ICA conference of 1968 which took place in Edinburgh. A special note of appreciation goes out to every member involved in making this conference a success. Through their time and dedication ahead of and throughout the programme the Board, the Programme Committee under the Chairmanship of Mr. Vasilis Koulolias, the eGovlab expert leaders on interaction day and of course the hosting country who extended a warm welcome, effort and resources ensured the smooth course of all conference activities. 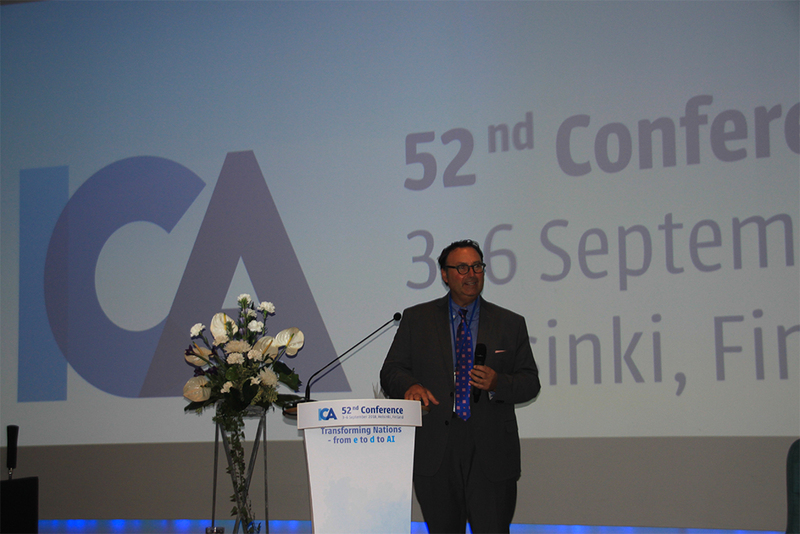 The 52nd ICA Conference themed "Transforming Nations- from e to d to AI" brought together CIOs and international organization representatives from over 35 countries who shared their best and sometimes not so successful case practices with one vision- to build services around citizens’ needs and in some instances even before they know they need them. Through the sharing of valuable know-how and best practice examples, this year’s conference examined how government CIOs can translate and embrace latest technologies including AI’s present but also future application within their digital strategy, infrastructure and services, while exploring among other the ethical and governance issues, soft and hard infrastructure as well as HR and capacity building. The Helsinki conference gathered officers from over 35 countries and organizations, representing Albania, Belgium, Canada, Cyprus, Denmark, Dubai, Estonia, European Commission, Finland, Ghana, Iceland, Israel, Japan, Kyrgyzstan, Latvia Mexico, Mozambique, Moldova, New Zealand, Nigeria, Norway, Portugal, Romania, Rwanda, Singapore, Sweden, Taiwan, The Netherlands, UK, Uzbekistan, USA, OECD, World Bank, OSCE and ICI Bucharest as well as a number of organizations and institutes, including: eGovlab of Stockholm University, Evondos OY, Fira Group OY, Institute on Governance, OP Financial Group, Tieto , Zoan OY and more. Furthermore, this year and for the first time, the Programme Committee introduced a new initiative in collaboration with the World Bank World Bank High-level Experts, Leaders, and Practitioners (HELP) Programme through the “ICA Knowledge Sharing IT Government Programme” with the aim to develop IT government professionals’ technological skills in technologically emerging countries. By facilitating this “Knowledge Sharing Seminar” or “Peer to Peer Education Lab” they brought together field experts and academia in order to address “digital awareness and implementation” in developing countries. All conference presentations and Country Reports are available in the Members’ Area.